This tea cup was one of my grandmothers and it was handed down to me. I love the delicate roses and the color of the cup and saucer. I enjoy using this to have a nice cup of Earl grey or English Breakfast tea. I love your teacup! Such a lovely blushing pink. And especially nice with the family connections! Thanks for sharing and linking to Tuesday Cuppa Tea! 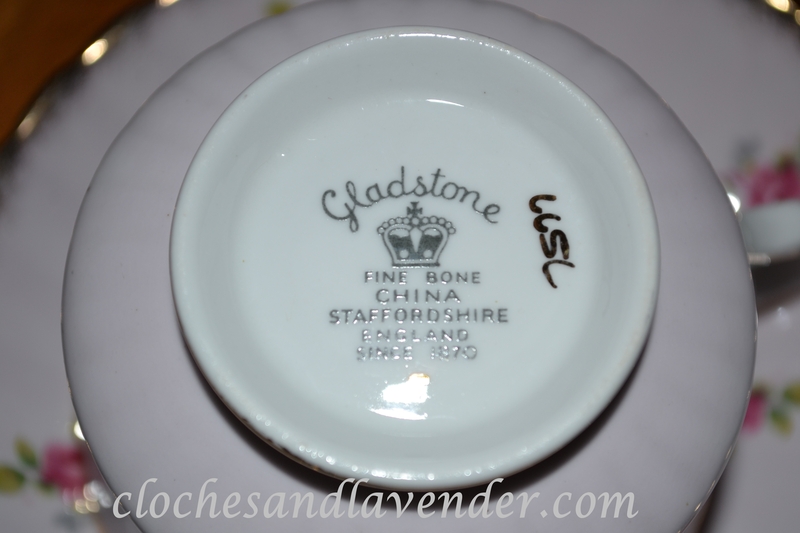 Oh this is the sweetest little Gladstone cup! I love the white with the pretty pink flowers strewn all over it! Gorgeous! How wonderful that it was handed down to you by loved ones. I have been to the old Gladstone Bottle Kiln museum. I am assuming your cup may have been made they just before they closed down. I wonder…. I wonder too. I have many old tea cups and I wonder where they were made and the history. By the way, Frugal Treasures Tuesday is back up and running and hope you’ll have time to share your ‘pretty in pink’ set! Thank you. The kitchen is finally done and will be posted very very soon.. It is fabulous. I love it and we are so happy. A sprinkling of sweet rosebuds…touches the heart. Passed down from someone you love? Even better! Thank you so much the cups that were handed down to me mean a real lot. I am following you via email and I hope you follow cloches and lavender back. What a beautiful cup…it must be wonderful to know that you are sipping your tea from the same cup that your grandmother did…a great thing! It is a great thing I have many of her tea cups. I love it! Thank you so much I do cherish the cups that were my moms and grandmothers. Your teacup is such a treasure! How lovely that it was your grandmother’s! It really is sweet with the tiny roses sprinkled all over it. A cup of tea with lovely memories of your loved one; what could be better! Thanks for sharing and joining me for tea. Enjoy your day. Thank you for liking your lovely teacup to Tea In The Garden! 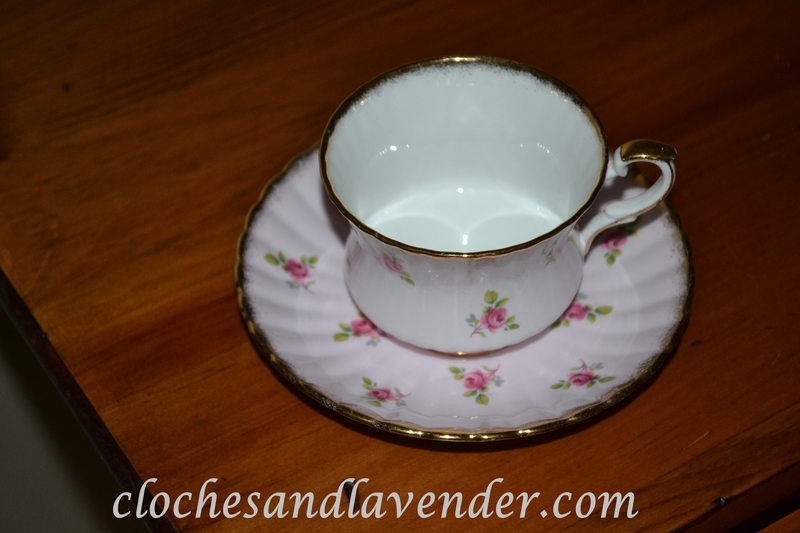 Johanna just sent me alot of info on my teaset which I was delighted to receive! I would love information on many of my tea cups. They don’t make mine anymore but I am sure you could find one similar. Oh what a retty tea cup, even better that it came from your grandmother. Thanks for coming by. 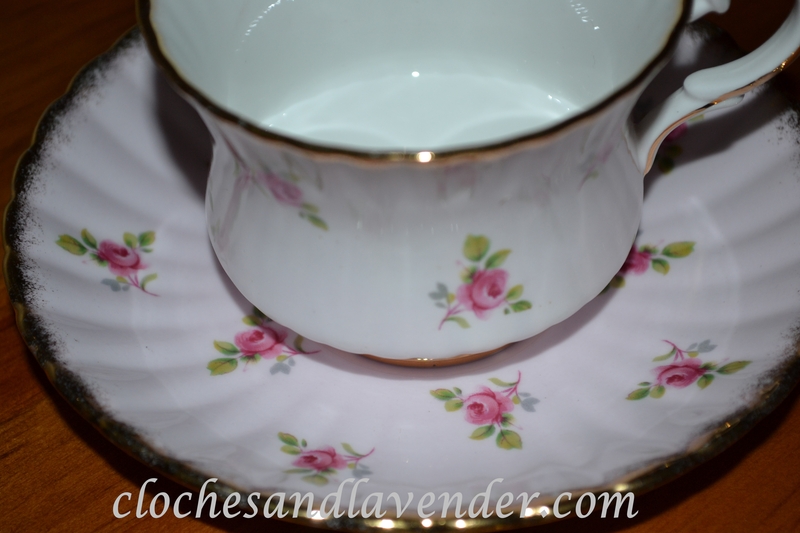 The cup and saucer are so pretty with the delicate pink roses all over. Gorgeous teacup, and from your grandmother- how precious. LOVE rose chintz china, and this one is exceptionally beautiful! What a gorgeous and sweet teacup and coming from your grand, it’s so special! Beautiful Rose Chintz bone china, just lovely. Happy Pink Sat. Thank you. I get very sentimental when I look at the cups from my mom and grandmother.